Now this is what I call a great comic book cover! Why is it a great comic book cover? Because there’s a gorilla on the cover that’s why! This is the kind of cover I’ve been talking about, a great villain smack dab on the front of the book. And a gorilla villain to boot. I’ve mentioned before how DC Comics came to realize that a comic book with a gorilla on the cover always seemed to sell better. Well, duh. I also read recently in Back Issue that the wheels at DC likewise subscribed to the notion that sales also went up with purple covers (well, that at long last explains that), fire, dinosaurs, motorcycles, a hero crying, or a question to the readers. So now we have some insight into why we’ve been encountering so many of those latter kinds of covers in our little journey here, not one of which does anything for me at all. But, put a gorilla on the cover, and you can slap me silly and call me Willy, but I’m gonna buy-that-book! Why those gorilla covers are so in my wheelhouse I don’t know, and it’s probably best to save to that investigation for a future Flash Friday, but the fact remains that I find them to be incredibly cool. And this cover is a beauty in the genre. So how’s the story? It’s not bad at all. A nice little John Clean Sweep Broome tale about time speeding up for the denizens of Central City to the point that they will live out their lifetimes before the end of the day. Then the Flash receives a mental command from Grodd saying that he’s responsible and that, if the Flash frees him from prison, he’ll slow time back down. 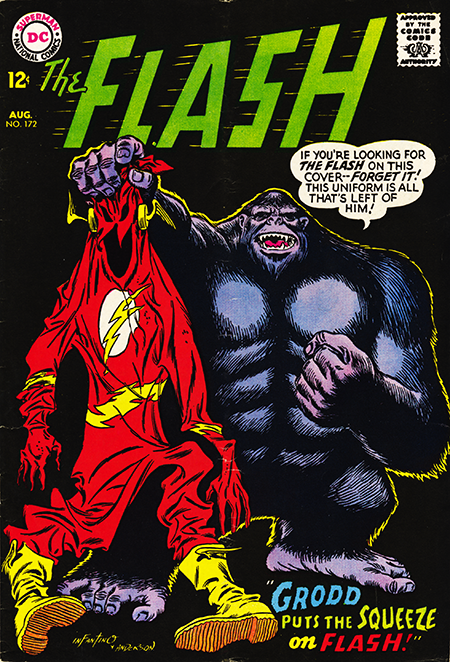 So the Flash paroles him from his escape-proof cell in Gorilla City in deepest-darkest Africa and, after keeping his end of the deal and slowing time back down, Grodd sets about taking over the world as he usually does when he has some free time. The thing is that the speed-up in time was caused, not by Grodd, but by a burst of radiation from the Sun that eventually slowed down all by itself. So Grodd’s bluff is called, and, after a brief tussle where the Flash vibrates out of Grodd’s grip and his own uniform to capture him, Grodd is back in his cell in Gorilla City. So, in the end, it was all for naught and Grodd’s little escapade only succeeded in one thing… he got lot of folks to buy that comic book.